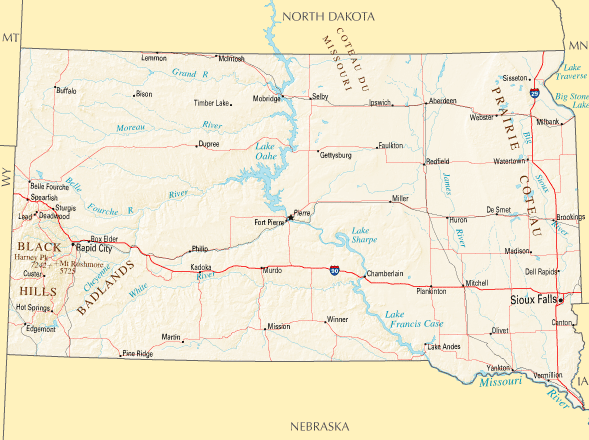 South Dakota is a midwestern state of the United States. The capital of South Dakota is Pierre, but the largest city in the state, by a rather considerably margin, is Sioux Falls, which has over 140,000 residents. Other cities in South Dakota include: Aberdeen, Brookings, Huron, Mithcell. Rapid City, Vermillion, Watertown and Yankton. 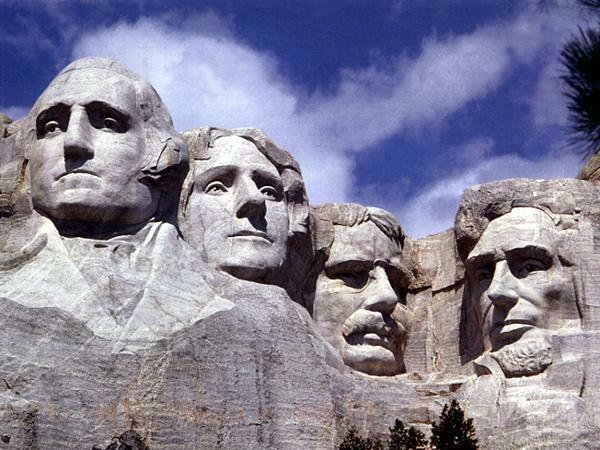 The state is best known as the location of Mount Rushmore, which contains four giant sculptures of American Presidents (George Washington, Thomas Jefferson, Theodore Roosevelt, and Abraham Lincoln). Each of the sculptures is approximately 60 feet (18 meters) high. It took 14 years (from 1927 and 1941) to create the sculptures, even though 400 workers were working on them. The sculpture is controversial with some Native Americans, because the land on which it is built was seized by the United States during the Black Hills War (1876 to 1877), even though the previous Treaty of Fort Laramie (1868) had granted the hills to the Lakota Tribe in perpetuity. Partly as a result of this controversy, a separate Crazy Horse Monument is currently under construction elsewhere in South Dakota's Black Hills (and has been for some years now). Although the state's best known tourist attractions are Mount Rushmore and the Crazy Horse Monument, there are other attractions and places to see in South Dakota. For example, if you ever visit Box Elder, you will want to check out the South Dakota Air and Space Museum, which is home to a large number of aircraft, including B-29 and B-52 bombers. Another interesting place to visit is Wall Drug (in Wall), which is a cowboy-themed mall, which has become famous, in large part, due to a quite incredible promotional campaign. Places to visit in South Dakota. Guide books with travel information for South Dakota. History information and books for South Dakota. Towns and cities in South Dakota.